No matter where Gail Roy of Presque Isle has lived or travelled to, one thing has remained constant. She has always been able to find a public or academic library to visit, one with its doors wide open for people from both near and far. 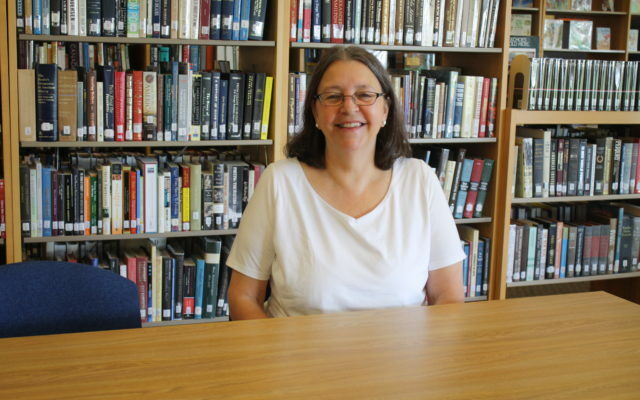 Roy is so fond of libraries that she turned her passion for literature, culture and community into a rewarding career that has taken her to libraries in many different settings. She is now the assistant dean of learning resources at Northern Maine Community College’s campus library and has helped expand cultural event offerings such as author talks and book signings and art displays and provide educational and technological resources for students outside the classroom. But before coming to NMCC and Aroostook County, Roy was a pint-sized library patron who often visited the public library in her hometown of Waterbury, Connecticut. The love of libraries was one that many members of her family shared. Roy and her mother would bring “piles of books” home for both of them to read while her aunt took advantage of a unique home art program. Trips to the library, as well as local art and history museums, also exposed Roy to kind, compassionate librarians who cared about educating the community through literacy programs and events. Roy’s parents provided much motivation for her to expand that education at the college level, as they had both begun college earlier in life but never completed their degrees. After earning her bachelor’s degree in history from the University of Texas at Austin, Roy took an office job at the Hospital of Saint Raphael in New Haven, Connecticut, and worked for 10 years before pursuing her master’s degree in library science. She worked part time at hospital libraries while taking classes from Southern Connecticut State University and then full time at Danbury Hospital Library after she graduated. Roy and her husband, Earl, also a former librarian, have lived everywhere from Texas to Idaho and Connecticut but decided to move to Aroostook County after searching for a region of the country with a quieter pace of life. After researching and visiting central Aroostook, the couple knew that Presque Isle was where they could imagine themselves settling down for the latter part of their careers. “The people here are genuinely warm and welcoming and want to contribute their talents to the community in any way they can,” Roy said. Roy and her husband moved to Presque Isle in 2005 and she first worked as a reference librarian at the Mark and Emily Turner Memorial Library before accepting her current position at NMCC three years later. She said that one of the greatest roles she’s had during her career is that of a mentor to many NMCC students who work in the library as well as those from other colleges who have interned there while earning their own library science degrees.